Interior of the main hall aboard the Cloud Queen. Very much a grand saloon interior. Piano player and maybe dancing girls. Again, that reaching for Victorian decor. There are, of course, multiple tables here, and more than a few games at them – couple tables for our poker analogue, at least one roulette wheel. Clientele in here is mixed. 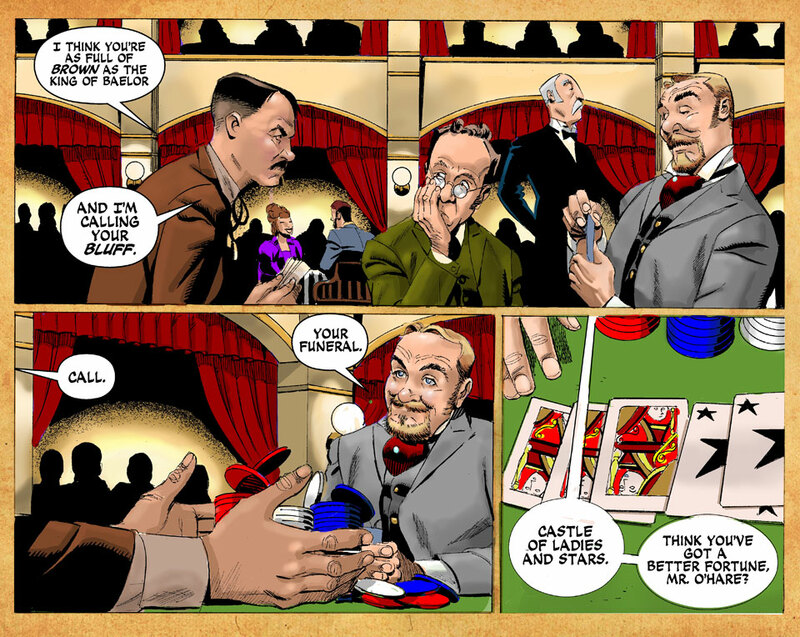 JOHNS, a smooth and smiling swindler, sits at one of the games of poker, playing away. He’s as much a professional gambler as he is a conman, and he has the slickness of the practiced liar. At the table with Johns’ game. Figure there are four others playing, you can mix and match who they might be. JOHNS is grinning as he discards. His stake at the table is fairly large – he’s clearly winning. 1. JOHNS: That’s either a mighty fine hand, or a mighty bold bluff, friend. Around the table, as the DEALER flips out the new cards. 1. PLAYER 1: Know when I’m beat, I’m out. 3. O’HARE: I think you’re a LIAR, Mister Johns. JOHNS, DEALER, and the remaining player, a fella named O’HARE, who does not like the fact that he’s been losing since he sat down here. 4. O’HARE: I think you’re as full of BROWN as the King of Baelor. 5. O’HARE: And I’m calling your BLUFF. O’HARE pushes what remains of his stake into the pot. JOHNS is relaxed, the conman’s smile in place. On JOHNS’ hand as he lays it out, three QUEENS, two ACES (“stars”). 9. JOHNS: …think you’ve got a better fortune, Mister O’Hare…? Good gravy, I sure do love that detail. Rick’s attention to body language is great! Terrific panels. I don’t think any particular sound effects needed to be added. My brain automatically filled in the din of card games, people dining, and piano playing. I’m rather confused by these panels. 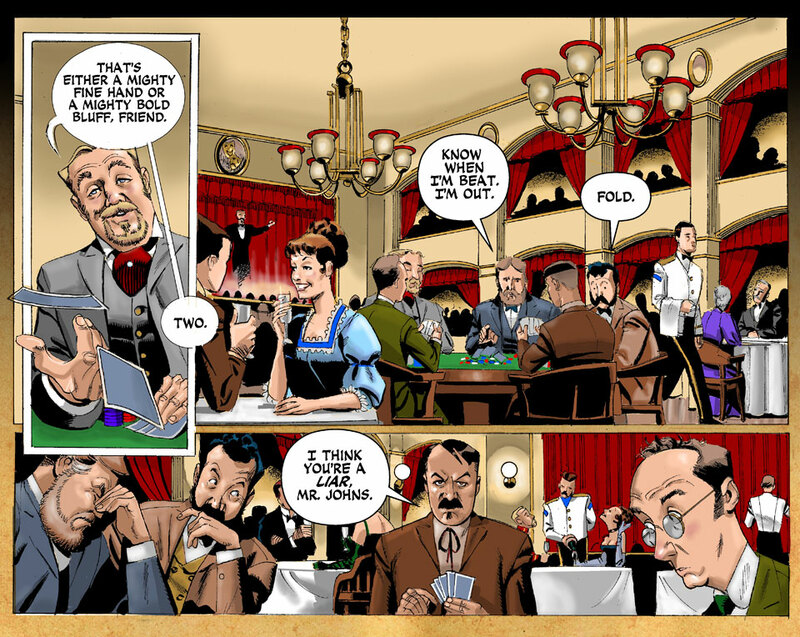 In the first panel the dialog indicates that Mr. Johns is calling someone else’s bet. (I thought the guy in green.) O’Hare calls Mr. Johns a liar and says he’s bluffing but Mr. Johns didn’t raise so how could he be bluffing. To bluff you need to drive the other players out by raising which Mr. Johns never did. Mr. Johns could be slow playing it but to call that kind of bluff, O’Hare would go out. He wouldn’t go all in. Otherwise I’m loving the series. Just a bit confused. …Someone’s assuming they’re playing poker? The rules of their world are not the rules of ours, I guess. Great execution of the facial expressions on the Green Suit guy in the third-to-last panel and Mr. Johns in the next.